It may not be 100% correct but I have once said that there is not one single casting part in Sweden that is fully optimized for the casting method. That can also be applied to Europe and the rest of the world. It may not be 100% correct but not far from it. Most times the casting products are designed without consulting a foundry or someone with deep foundry technology expertise. The latest years increased aim for structural optimization, like for example Optistruct, the use of casting process simulation as well as a higher will to optimize the castings for the casting process may improve the situation. To optimize a casting to 100% may not be realistic since the casting process is very complex. I can say with certainty that more than 90% of all castings in the world are not fully optimized for casting. This article is about how to solve this issue. 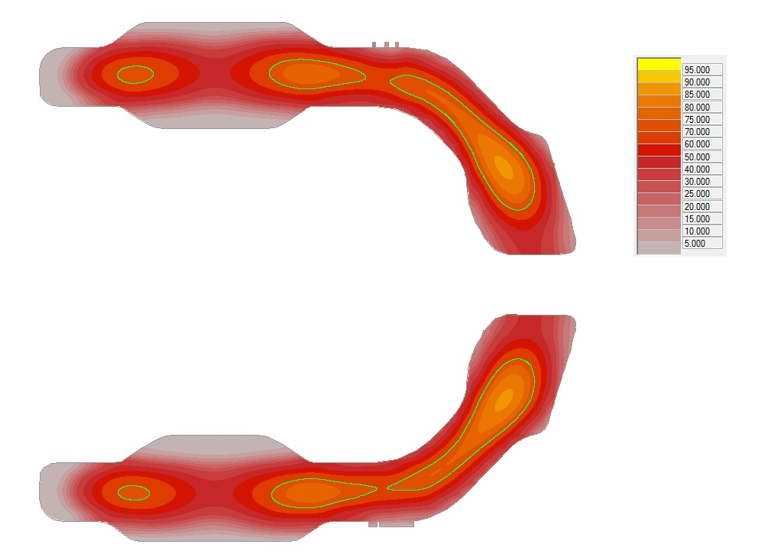 1- Use casting process simulation to understand the complexity of the solidification. The human brain may understand a two dimensional solidification but a third dimension creates more or less a shorting in our brain if we even try to understand the complex correlations. Today the casting process simulation is highly reliable and gives very good results. 2- Define where you want to have controlled split of the melt. The casting designer should in principle already on the design stage define splitting places and design the part from these criteria’s to reach a directional solidification. This is the only way to avoid sh­rinkages completely. This is also a way to avoid more feeders than absolutely necessary. The split points should be a design constraint with the same weight as a design constraint of functional art. Picture comments: There are distinct split points where the arrows are placed. It looks good but the angle of the metal front is too blunt, it should be pointed. The metal front should look like an arrow with a sharp edge. The inner angle of the arrow should be small to make sure that there is no risk that the melt divides in small islands. The circle shows a hot spot area which is hard to feed or chill. The risk for shrinkages in the heat center is big. Picture comments: This is an example of a casting where there is serious splitting of the melt. This will cause shrinkage defects. Using some simple design rules when designing the casting will result in a more directional solidification and also define distinct splitting points. 1- Decide already in the design phase where the feeders should be placed. Prepare the placement to minimize cutting and grinding and save energy and time. 2- Do not use chills. Chills create a high temperature gradient in the localized areas where they are placed. This increases the risk for cracks a lot because of the different solidification times in comparison with the mold material. The cracks will not occur where chills are placed, instead in between the chills. Chills also complex the solidification pattern and can work contra productive for a directional solidification. Besides that the chills also changes the microstructure in the localized areas which then can give different strengths of the material. 3- Pattern maker allowance and tapers should be designed from the start. The simulations need to be made in correct section sizes and volumes, also the taper and the pattern maker allowance must be defined. If this is not taken into account from the beginning, all changes made to achieve a directional solidification can be eaten up by the changes that are necessary to make. In general the foundry should not have to use “Duck tape” to be able to produce the casting. The casting should be designed for the casting process. Adjustments for the casting process can only be made to a certain extent when the part is ready for production in the foundry. This must instead take place as early as possible. The component should be seen as a casting already from day one, not only as a functional component. Consider also the 90/10 rule that applies if you do a good design work from the start. Much less time needs to be spent making correctional measures. My advice is to spend a lot of time in the beginning to get an easy production start of the casting. I have heard many say that the casting quality is up to the foundry to create but I think it is the design engineers that really create the possibility to make a sound casting without defects. I have seen that more and more companies have started to work like this but I hope for an increasing number. By applying the rules above you will save material, energy and money and in the end this will be good for our inner and outer environment in the foundries and also the world.